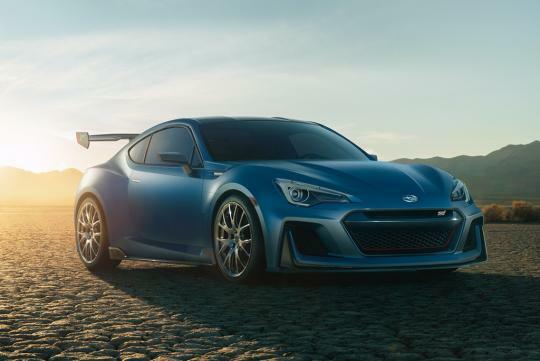 Seems like Subaru is more interested in building a coupe with a mid-mounted turbocharged boxer combined with a hybrid powertrain than a turbocharged BRZ! According to Car and Driver, an experimental prototype is being tested at Subaru's Tochigi proving grounds. Apparently, the machine has a mid-mounted turbocharged boxer delivering power to the rear wheels, and two electric motors powering the front ones. As of now, the whole powertrain could see daylight in either a sports coupe or a sports crossover but the company is leaning more towards using it in the coupe. As of now the coupe is said to feature a turbocharged 1.6-litre seated behind the driver’s seat and combined with the two electric units, the car should be pushing out “somewhere north of 328bhp”. Good idea. Then when the hybrid front fails, dismantle, throw, save weight & becomes a 280ps RWD coupe. Mid mounted engine on a crossover? How? Unless 2 seat crossover or you sit _really_ high up. I think any car company even the most crap China co. can make a >130hp car. Just a matter if they see a market.